File contains two newspaper clippings of articles by Barbara Hinds about famine in Ethiopia; a list of members of the Emergency Committee for Ethiopian Relief; and correspondence with Robert L. Stanfield and Alvin Hamilton. File contains correspondence with the Atlantic Advocate from 1960 to 1965. 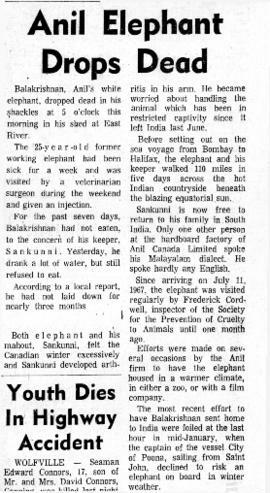 Item is a cutline written by Barbara Hinds to accompany a photograph of Sankunni, an Indian mahout or elephant keeper. There are two copies of the cutline, one on yellow paper with corrections written in pencil. 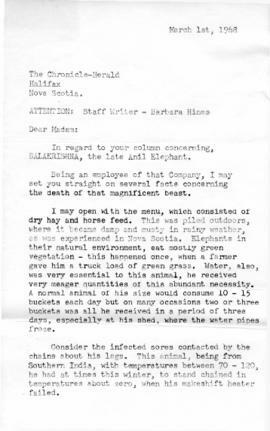 File contains cutlines written by Barbara Hinds for the Dalhousie University Faculty of Medicine and a letter from Hinds to Ms. Wood. The cutlines were sent to Ms. Wood along with the corresponding photographs, which are not included in the file. File contains a reproduction of a newspaper article written by Barbara Hinds called "Doctor of the Year honours go to H. C. (Curly) Still." The article is accompanied by a photograph of Still. 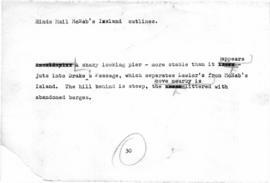 File contains a typed draft of an article about conservation and McNab's Island with corrections. File contains a typed draft of an article about the carriage of copper concentrate by ship. The article is typed on several smaller pieces of paper which have been glued together. File contains typed drafts of articles for a column called "Life's Like That" for the Mail-Star. File contains typed drafts of articles with corrections. The articles include one about Eskimos of Northern Quebec for Hinds' "Personally Speaking" column, and an article about making your own liquor called "Black Listed."